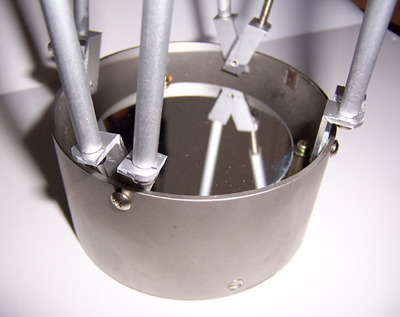 The mirror cell is constituted by a triangular aluminium base and a support of mirror made with 2 hard disks glued with exopy. 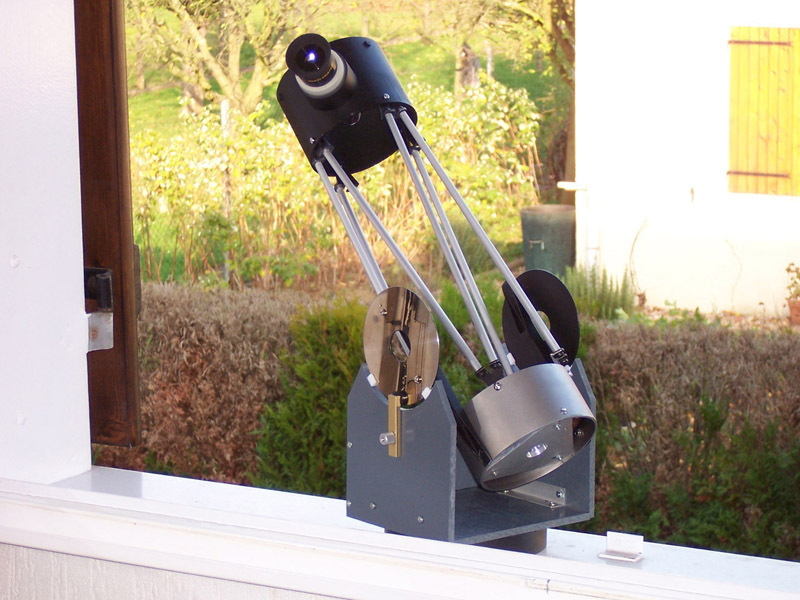 3 screws + springs allow adjustment of the primary mirror. 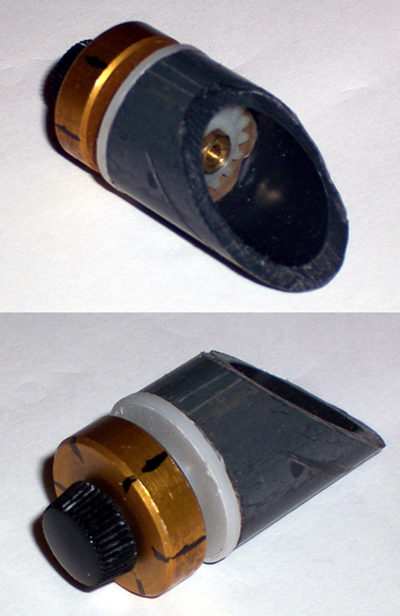 The bottom of tube is an piece of steel cylinder. 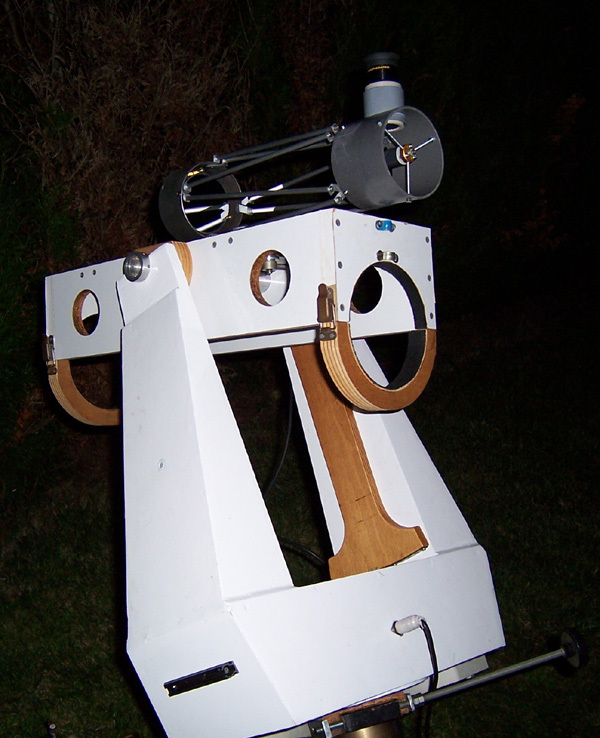 Given the weak weight of the primary mirror, that allows to move the centre of gravity near the mirror. 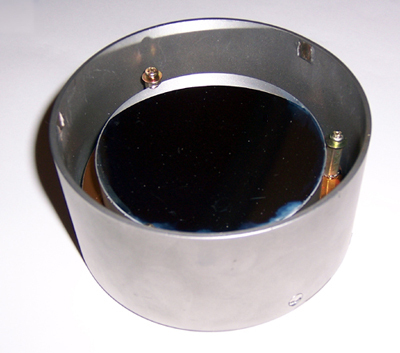 The primary mirror is 80/400 mm extract from a spectrophotometer. It was not planned for imaging (only photometry) and shows regrettably optical defects. 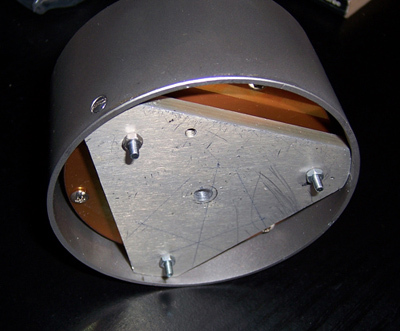 The secondary mirror was cut in a flat mirror founded in a scanner. Small axis is 20mm. The spider is an assembly of thread stalks (3mm diam. ), a piece of PVC tube (20mm diam.) and some screws and nuts. 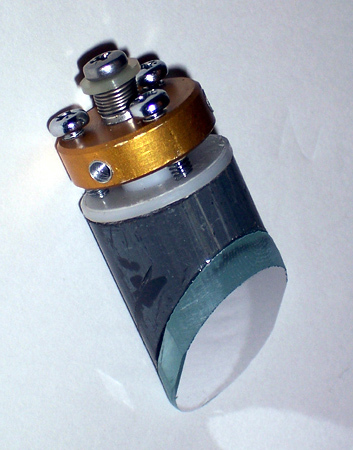 The upper ring is a piece of 100mm diam. PVC tube. 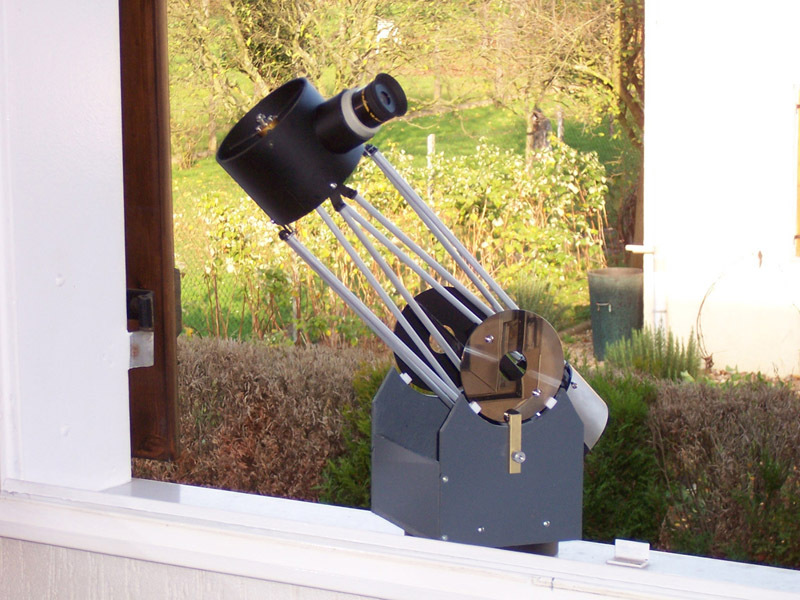 Eyepiece holder is made with 2 pieces of PVC tubes. One slides easily in the other one to make adjustment. 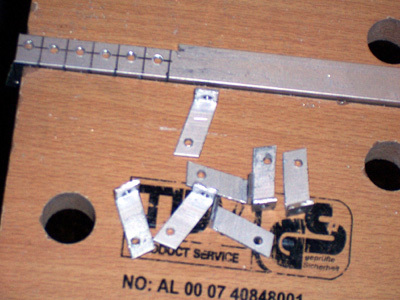 The joins for the cage and the bottom of tube were cut from a piece of aluminium valley. 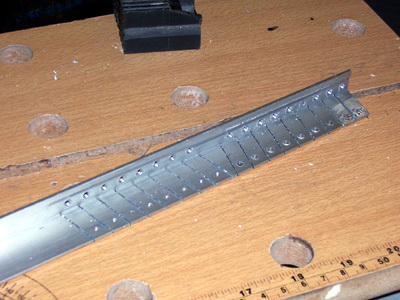 It was regrettably necessary to buy aluminium tubes (twice 1m, 6mm diam.)... extravagant! 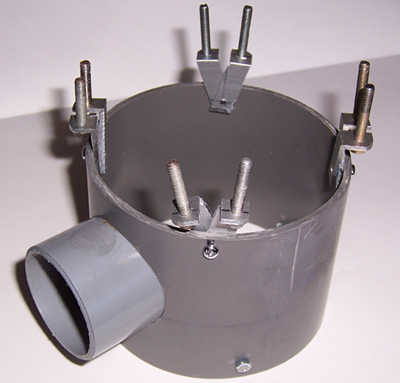 Assembly of joins, then tubes. The rocker box is cut from a plate of PVC. 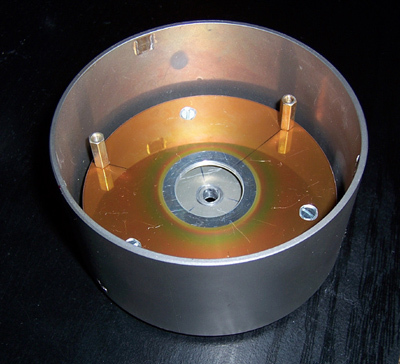 Altitude bearings are still hard disks. PTFE pads measure approximately 5x6x7mm. Given the thoughtlessness of the instrument, It is easily unbalanced in the slightest change of ocular. 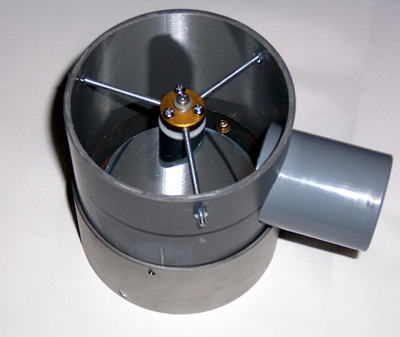 I thus have to equip it with a brake which we can see on the side of the rocker box. ... and fixed on the mount of its big brother.